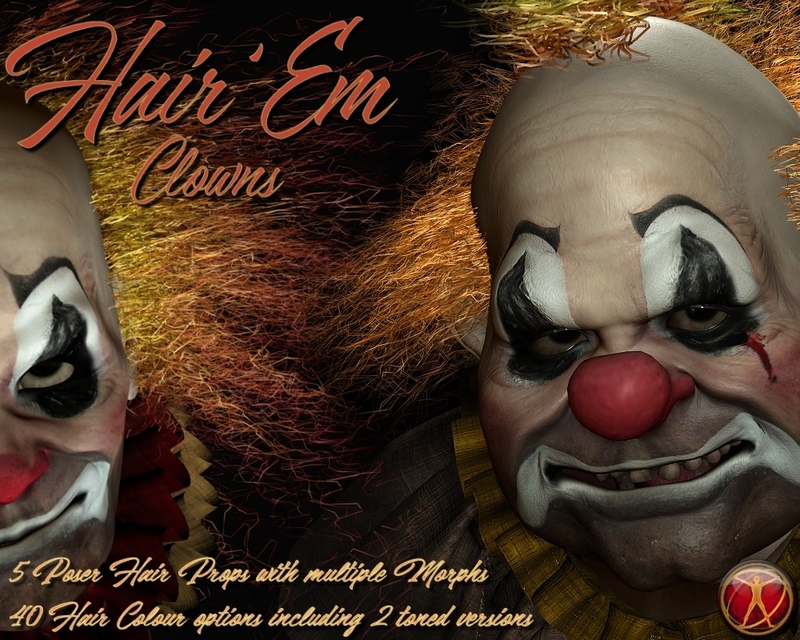 This a brand NEW product to see in 2019....So lets "Send in the Clowns"
This is a standalone item,containing 5 unique fun clown style hair props, easily useable and bring in as many as you choose into your scene,adding different materials to make some crazy wild clown hair styles,each hair prop contains styling morphs to create even more designs. Created to fit your beloved Michael 4,but these easily apply to any figure you chose and can be resized very quickly, we have included a HTML user guide to give you even more options and techniques and the best thing you do not even need to go into your Poser Hair Room. Just click and apply and then morph away using the built in dials. Hair 1 includes 4 style morphs for the Hair, Back Taller,Back Wider,Back Droopy,Back Droopy Wide. Hair 2 includes 12 style morphs for the Hair, Rasie All,Raise Back,Raise Sides,Droop All,Droop Sides,Droop Back,Lengthen All,Lengthen Back,Lengthen Sides,Shorten All,Shorten Back,Shorten Sides. Hair 3 includes 10 style morphs for the Hair, Bigger All,Bigger Sides,Bigger Top,Smaller All,Smaller Sides,Smaller Top,Pointier All,Pointier Sides,Pointier Top,Droopy Sides. You can easily go into your material rooms and change the colours to anything you like and save them out to add to your material library..